Our product range comprises laboratory and automation systems for coating, developing and wet-processing wafers / substrates used in the assembly of sensors and MEMs (Micro Electro-Mechanical Systems) to be applied in photovoltaics, FFD, semiconductor technology and optoelectronics. Solar cell assembly and the production of solar cell modules are target industries for the ATM Group. 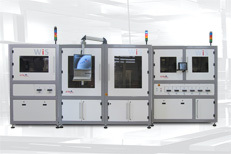 In the assembly and quality control of solar cells the ATM Group designs state-of-the-art products for production inspection and control by vision systems and automation technology. The ATM Group is committed in the field of assembly and automation technology in cooperation with European research and development institutes seeking to provide standardized solutions for the semiconductor and solar industries. We advise, conceive and realise projects around the globe and we are able to optimize our systems by the latest software tools, techniques and automation components. Top quality performance and efficient use of the latest technologies and systems enable us to steadily enhance our value creation while improving the implementation of our cost to benefit ratio.